When I was growing up, Sennheiser was the Ferrari of headphones—a company with a reputation for producing the best product, without compromises. Given this context, the $450 MM 450-X Travel Bluetooth Headphones seems like a bit of an odd product: Instead of a purist’s headphone, the MM 450-X offers a slew of features audiophiles normally abhor, including Bluetooth connectivity, noise-canceling circuitry, and microphones—features that usually adversely affect sound quality, but that also dramatically increase the convenience and utility of headphones. To audio geeks, these features may be akin to adding traction control and a navigation system to a Ferrari, but, well, even that’s happening these days. The question is, does Sennheiser’s audio expertise make for a high-end travel headphone worth having? My first impression on handling the MM 450-X was how thin—almost spindly—it seems, belying the quality of materials and construction. The headphones are actually quite sturdy, but the two headband pads look as though they would tear off at the first hint of abuse. The headband is also curved tightly enough to form a closed loop when the headphones aren’t on your head, but I never experienced any head-vise discomfort during multi-hour listening sessions. The MM 450-X features controls on the right earpiece that are laid out in a common four-way configuration, with volume up and down buttons at the top and bottom, respectively; previous- and next-track buttons toward the rear and front, respectively, and a play/pause/power button in the middle. Two additional buttons located along the bottom edge of the right earpiece control Bluetooth connectivity and NoiseGard, Sennheiser’s name for the company’s noise-cancelation circuitry. The depth of Bluetooth implementation is among the deepest I’ve experienced, with a long list of control commands. Some of the less common options include redial, mute, and track scanning, along with the capability to transfer a call back to the phone. The MM 450-X offers a long list of Bluetooth commands. This versatility doesn’t come at the expense of being able to use the most common commands easily and simply. For example, when used with an iPhone or iPad, I found the MM 450-X’s use of the Bluetooth button to activate Siri much more convenient than the “press-and-hold a multi-function button” approach of most Bluetooth headphones. The NoiseGard button also activates a unique TalkThrough feature, common in aviation headsets, that pauses audio playback and lets you hear the audio from the MM 450-X’s external microphones—in other words, you can carry on a conversation, or take an audio measure of your surroundings, without having to remove the headphones. 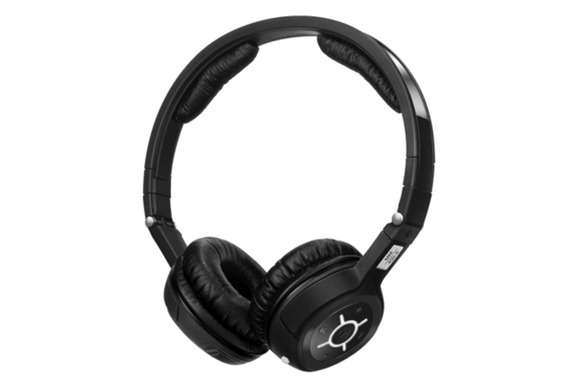 The MM 450-X uses a CSR Bluetooth chipset, found in many higher-end Bluetooth headsets, and offers battery life comparable to those similar products: Sennheiser claims battery life of 8, 10, or 20 hours for wireless noise-canceling, wireless, and wired noise-canceling listening, respectively. These wireless-use claims were in line with what I found during use, though I didn’t test battery life for wired noise-canceling listening. Eight to ten hours of use may seem short for wireless use compared to other—often less-expensive—headphones. One reason higher-end models have shorter battery life is that the CSR chipset includes higher-quality AptX Bluetooth audio encoding, which requires more power than standard A2DP stereo-audio encoding. But given that AptX’s benefits are, to some extent, lost when using low-bit-rate audio files, it would be nice to see a more power-efficient version of the MM 450-X. Sennheiser isn’t new to noise cancelation, as its NoiseGard technology was introduced in headsets designed for Lufthansa back in 1987, and the company’s first pair of consumer noise-canceling headphones was released in 1992. The MM 450-X uses the latest iteration of Sennheiser’s NoiseGard, version 2.0. I managed to test the MM 450-X’s noise-canceling performance in a variety of conditions, with external noise levels ranging between 50 to 95 dB. Overall, I came away impressed with the reduction in audible noise level, which I found comparable to what a good pair of generic foam earplugs would provide. On the other hand, unlike Sennheiser’s larger MM 550-X, which uses full-size earpieces that completely surround your ears, the MM 450-X uses an on-ear design that doesn’t block as much high-frequency noise as I had hoped. That said, this is a tradeoff you make for portability, and the MM 450-X is comparable in this respect to other on-ear headphones I’ve used. Thanks to an on-ear design, the earpads don’t block as much high-frequency noise as I had hoped. Another minor issue I experienced was that the noise-canceling circuitry would occasionally generate clicking or thumping noises—the former with lower ambient noise levels (roughly less than 55 dB), the latter with transient/intermittent noises. For most environments where you’ll likely use noise-canceling headphones—say, on a plane or train, or in a noisy office or crowd—chances are these minor issues won’t affect you, but they’re worth noting. The MM 450-X lets you to listen to music in any of four ways: wired with and without noise cancelation, and wireless with and without noise cancelation. I spent most of my listening time using the MM 450-X with a Bluetooth connection. My first impression of the MM 450-X’s audio performance, tested with the noise-canceling circuitry disabled, was how bright the headphones sound: The treble and upper midrange are somewhat over-emphasized in the presentation. On the other hand, while low bass is a little lighter than what some listeners might like, the MM 450-X does a good job with bass guitar and kick drums, and it produces crisp bass without muddying more-dynamic passages. A common gripe with closed headphones is a limited soundstage, but even though the MM 450-X doesn’t produce the most expansive soundstage I’ve heard, it does a good job of placing instruments in the correct spacial positions. My biggest criticism of the MM 450-X, is that the aforementioned treble boost is exacerbated with the noise-canceling circuitry enabled. In A/B testing, I heard a combination of more treble and what sounded like an increase in overall gain with NoiseGard on. I’m assuming this treble bias is meant to counteract high-frequency noise that might make its way past the less-than-perfect earpad seal, and the result isn’t unpleasant, but it does color the music. (In brief use watching videos, the treble bias wasn’t as noticeable.) Still, given the inherent characteristics of noise cancelation, the MM 450-X is one of the better performing noise-cancelation headphones I’ve used. The MM 450-X is one of the better sounding noise-cancelation headphones I've used, despite a treble bias. The MM 450-X is equipped with an array of microphones on the exterior and interior of the earpieces. Many of these provide audio for the noise-canceling circuitry to work with, but they’re also used for phone calls, Siri, and other voice-related functions. I came away disappointed with the performance of the MM 450-X during calls and with Siri. Voice quality during calls was only average, and my success rate with Siri was lower than with nearly every other headset I’ve tested. Is the MM 450-X the Ferrari of noise-canceling headphones? It’s certainly constructed well enough to outlast a couple generations of iPhone or other smartphone, and the Bluetooth implementation is deep, providing a huge number of control commands while maintaining simple access to the most common ones. I also found the overall audio quality, both wired and over Bluetooth, to be very good, with accurate soundstaging, crisp reproduction of instruments and vocals, and tight bass. Where the MM 450-X falls short is in its performance as a headset and in its audio performance with noise-canceling circuitry enabled. While one could argue that you can’t expect stellar audio from any noise-canceling headphone, the Sennheiser brand and the MM 450-X’s price set certain performance expectations. What’s disappointing here is that, to use my car analogy, while Ferrari doesn’t make its own navigation system, Sennheiser has long made noise-cancelation systems. Though the MM 450-X is good, it’s difficult to give an unqualified recommendation for a $450 noise-canceling, Bluetooth headset that doesn’t have best-in-class noise canceling performance and functions poorly as a Bluetooth headset. Sennheiser's MM 450-X combines noise-canceling and Bluetooth technology in a lightweight travel headphone.